I was checking out the trash bin in my Gmail the other day, because, hey, I get bored, when I saw this little headline in Gmail's webclips. 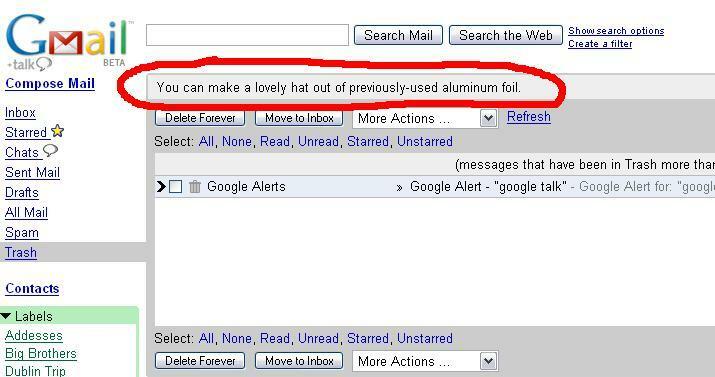 "You can make a lovely hat out of previously-used tin foil." This is a joke I see on Slashdot a lot. 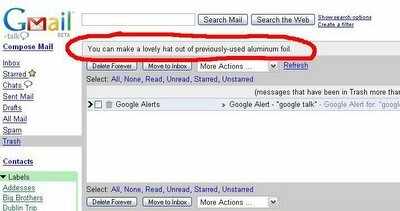 Basically, if you want to accuse someone of being too paranoid about the government or big brother reading their emails or monitoring their cell phone conversations or whatever, you'd say that they should get a tinfoil hat. This implies that they they are akin to a crazy person wearing a tinfoil hat so the CIA can't read their brain waves. I thought it was pretty funny that Gmail put this in there, especially considering all the controversy they stirred up when it was announced, either over scanning their email for advertising purposes or something in their FAQ about not being able to guarantee that their e-mail will be permanently deleted. Is Google making a subtle dig at people who delete all their email, despite Gmail's suggestions not to? Weird! Why does google want you to keep your email? You'd think the less space that you use the more they would have to give away. It's not even a 'you could keep all your email' they're saying you should. Maybe it's a rogue google techie alerting us to the vast google spying on your email conspiracy. It looks like they just hook up to an RSS feed that features Recycling Facts. I hadn't noticed that, but then again, I don't go my Trash folder very often.